I’ve always found it interesting that people tend to express an issue with “morning drinking” – often suggesting that it is a warning sign of alcoholism. Yet, there are certain cocktails that just seem to be MADE for mornings. One prime example is the Mimosa, a cocktail people absolutely love to enjoy during brunch. Another that comes to mind is the Bloody Mary. And personally, I think that this Sparkling Tequila Sunrise shows great potential as a morning cocktail. At least, it gets my vote! 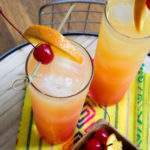 Make a Sparkling Tequila Sunrise for brunch! After all, this wonderful cocktail starts off with orange juice – which we all know is the perfect morning beverage. (Well . . . after coffee, because NOTHING beats coffee!) But to make that orange juice taste even brighter and more “effervescent”, you combine it with the lovely flavor of Sparkling Ice Classic Lemonade. Add a little grenadine to sweeten the deal and then – tequila – because everyone knows that the best mornings come with just a bit of a buzz. Garnish with a maraschino cherry and an orange slice and you have a cocktail that is delicious, beautiful, and perfect for mornings! If you’re hosting brunch some weekend, whip up a batch of these to serve instead of your classic Mimosa. I bet your guests will love them. This cocktail would also make a tasty treat served poolside on a hot summer day – and that’s only the beginning. So, the next time you’re on the lookout for a refreshing, fruity cocktail, why not give these Sparkling Tequila Sunrises a try? You’ll be glad you did! Using Sparkling Ice for part of the citrus flavor helps to keep the calories down in this drink. Since it still has calories from the orange juice, tequila and grenadine, I wouldn’t call it a low-calorie cocktail, but rather a skinnier version of the classic. It has 210 calories, and can shave as many as 100 calories off the classic recipe. Love #brunch? 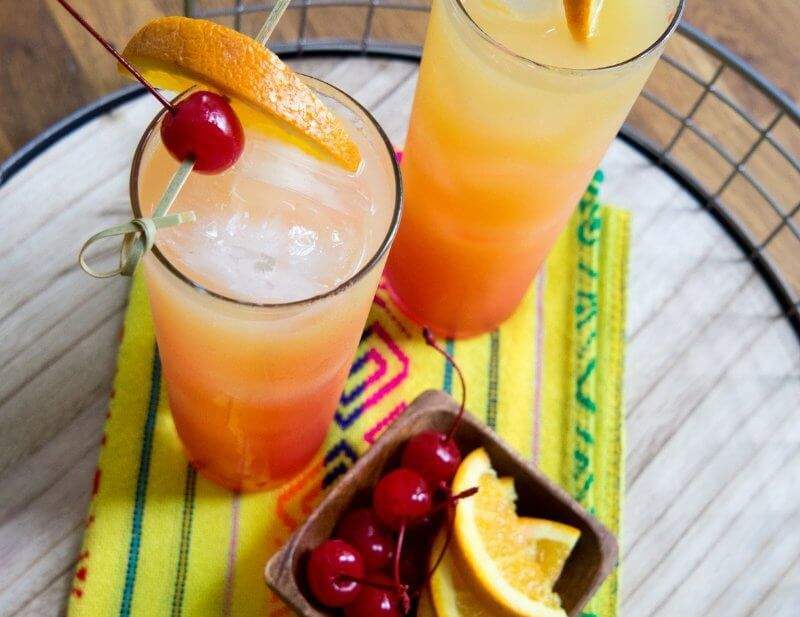 You’ll love adding our recipe for a sparkling #tequila sunrise to your brunch menu. It’s a perfect brunch #cocktail. To enjoy this drink without alcohol, simply omit the tequila and add a bit more orange juice or lemonade. Fill a tall glass with ice cubes, then the orange juice, and tequila. Top with Sparkling Ice Classic Lemonade and grenadine, then garnish with a maraschino cherry and orange slice and serve. This drink makes a great pitcher drink too. You’ll want to multiply the recipe depending on the size of your pitcher, but it serves beautifully. Be sure to save the grenadine to pour over the top of each glass so it’s got that gorgeous ombre. 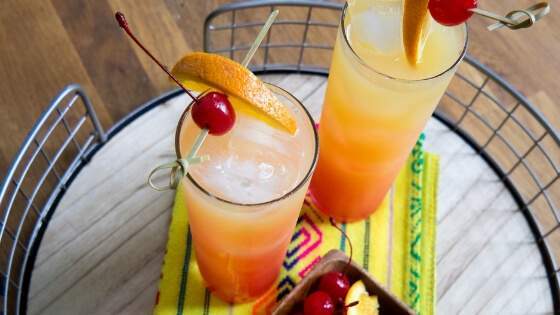 A sparkling Tequila Sunrise cocktail is delicious and refreshing. Perfect for Cinco de Mayo or anytime you want to enjoy a sparkling citrus beverage, it's also lower in calories than many traditional recipes for a Tequila Sunrise. 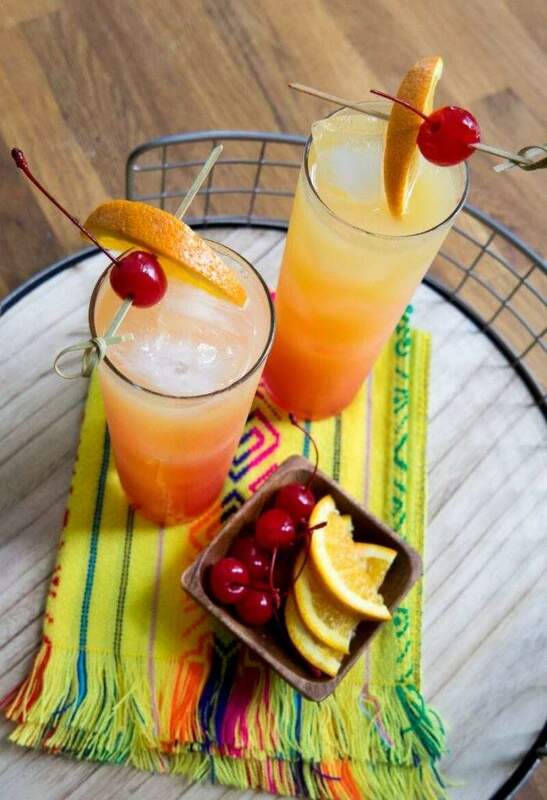 Please let us know how you enjoy our Sparkling Tequila Sunrise recipe. If you make it yourself, please let us know on Pinterest that you tried it and tag us with #champagneandcoconuts on your Instagram photo. If you haven’t had a chance to make it yet, be sure to save the recipe on Pinterest so you’ll remember where you found it. You may enjoy following our Pinterest Boards, Tequila Recipes and Cinco de Mayo Cocktail and Mocktail Recipes.